“That’s just ridiculous. I’m out,” said the Patriots QB when the issue of Edelman’s drugs ban was brought up. 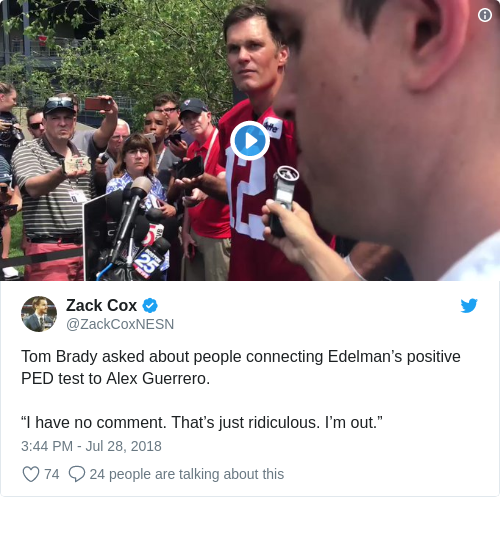 LEGENDARY QUARTERBACK TOM Brady cut short his press huddle at New England Patriots’ training camp today, calling speculation linking trainer Alex Guerrero to teammate Julian Edelman’s drugs ban “ridiculous”. Brady had already brushed off a question about the reports surfacing last season of a rift between him and coach Bill Belichick, which gained renewed traction when Brady opted not to participate in voluntary off-season workouts for the first time since 2010. “I have no thoughts,” Brady said in answer to questions about rumours of turmoil in the team. One source of friction was reported to be Guerrero, Brady’s longtime personal trainer who has also worked with Edelman and other Patriots players. Edelman, who missed the entire 2017 campaign after suffering a torn knee ligament in the pre-season, was suspended for four games in June for violating the NFL’s performance-enhancing drugs policy. Asked his reaction to speculation linking Edelman’s ban to Guerrero Brady said he had no comment. “That’s just ridiculous. I’m out,” the five-time Super Bowl champion quarterback said before departing. Edelman also spoke to reporters today, saying in his first comments since losing an appeal of his suspension that he was “disappointed”. “Obviously you’re disappointed with it,” he said. “But I’ve got to follow the protocols a little better and make sure this never happens again. I’m accountable for my actions.